Welcome to Cult Corner where we dive through the bargain bins to determine if a movie is trash or treasure. Today’s pick… J.R. Bookwalter’s The Dead Next Door. At the risk of sounding elitist for a second here, there’s something I’ve noticed a lot when it comes to how people outside of the horror fandom view certain subgenres. I’ve seen this idea promoted time and time again that older, lower budget horror movies are nothing more than grisly scenes of splatter strung together by a non-existent plot, but that’s generally not true. Zombie movies in particular get this bad rap and that’s such a weird idea to me. 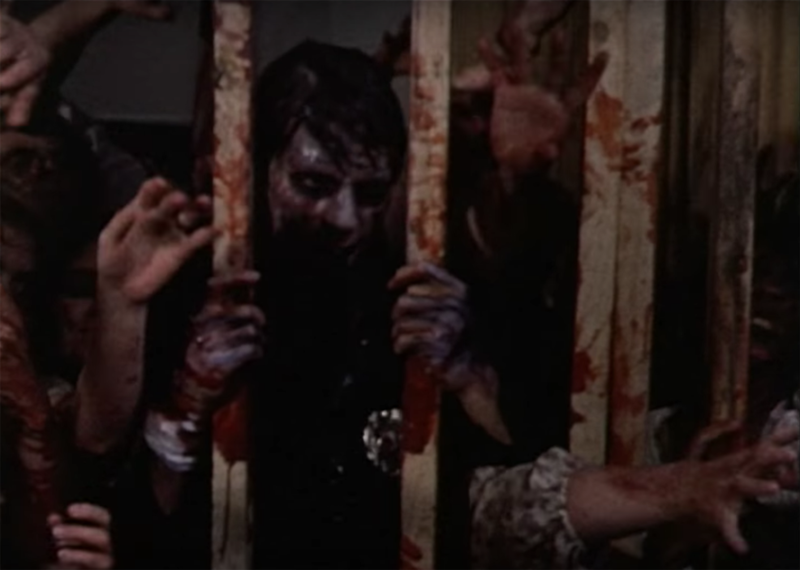 Looking back on the classics we have the work of George Romero standing tall with deep, character-driven, and socially conscious films, so why is the general consensus that zombie flicks are nothing more than a thinly veiled excuse for gore? Why do fans of The Walking Dead feel the need to try to justify their love of the show by exclaiming, “It’s not about the zombies, it’s about the characters!” There is a huge disconnect here and honestly I couldn’t quite figure out where the stereotype came from. That is…until I saw The Dead Next Door. 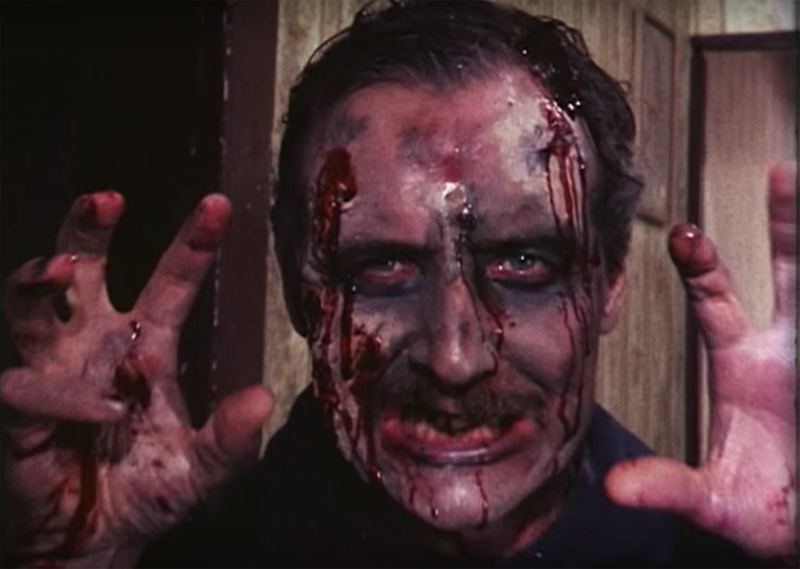 The Dead Next Door follows a team of elite zombie killers fighting off a crazy cult and tons of the undead while scientists attempt to manufacture a cure for the virus, and that’s all that you really need to know about the plot. There are some fun turns in the last act involving a talking zombie who taunts someone he’s planning on eating, but for the most part it’s all really straight-forward. The characters are thin, the acting is terrible in the best possible way, and the gore is plentiful. Simply put, this is the movie that people are thinking of when they think of the mindless splatter-fest and honestly it’s kind of glorious. The first thing that you’ll see right off the bat is that the film quality is absolutely atrocious. This was shot on Super-8 instead of something professional, and it really shows. It looks like a snuff film. In spite of this, the direction actually shines through with some pretty nice cinematography sprinkled throughout and everything else at least looks competent. The lighting is generally well-done and you can see a very clear and present influence from Sam Raimi, who served as executive producer under the pseudonym, The Master Cylinder. The sounds quality is equally poor, with the dialogue being mostly, if not entirely, dubbed over. Bruce Campbell even serves as the voices for two characters in spite of not actually appearing in the movie. This isn’t a foreign film so I’m really not sure why the dubbing exists, but there it is. The reason to watch this movie is apparent. The gore. Like clockwork, every 5 or so minutes another character is bitten, eaten, disemboweled, or shot. Sometimes it comes out of nowhere. Characters will be having a conversation and then one of them will get bitten with absolutely no build up whatsoever. When it happens, it looks good and there are some pretty creative gore gags. A severed head biting off someone’s fingers and then seeing them come out the bloody neck hole a few seconds later comes to mind in particular. The zombie makeup is pretty grisly for the most part and there are even some animatronic puppets. They look awful, but it’s still more interesting to look at than a bunch of extras painted slightly pale. B movie or not, this film skates by, simply because of the sheer amount of energy and enthusiasm that is apparent in every frame. It doesn’t reach the level of other more well-known low budget features like The Evil Dead or Bad Taste, but you can tell that director J.R. Bookwalter really wanted to make something worth watching. The technical limitations are clear, the plot is thin, the acting is over the top and strangely dubbed over, and it looks like a home movie, but the pace is quick, the zombies are cool, the kills are inventive and plentiful, and it’s certainly never boring. The Dead Next Door is charming in how gritty and brutal it is, and for once I’ll gladly point out that this one is just about the zombies.